Holiday Inn Garden Court Lyon-Villeurbanne , enjoys an ideal situation in the heart of Lyons. 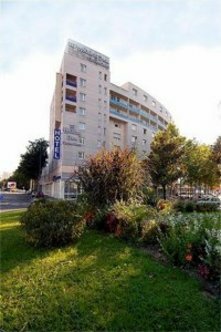 The hotel is close to the Parc de la Tete d'Or, the Cite Internationale and the Lyons Palais des Congres. Downtown Lyons is less than 10 minutes away (Tramway and underground Metro station, 250 m). Part-Dieu TGV railway station also has a direct access via tramway. Discover the many aspects of the city: Gallo-Roman Lyons, Medieval Lyons, Lyons Renaissance, Modern Lyons and Lyons tomorrow. Holiday Inn Garden Court Lyon-Villeurbanne has 79 comfortable rooms. All are equipped with WiFi internet access and offer an office space, tea/coffee-making facilities, satellite TV and Canal+. Our air-conditioned restaurant "Le Grand Camp" proposes traditional and regional cooking in a charming setting. The establishment also has 4 adaptable function rooms (total 210 m&reg), with a capacity of up to 180 participants, ideal for meetings and business events. Business Corner available 24/7. Parking facilities are available.